The former superintendent of Atlanta Public Schools was among the educators who surrendered to authorities Tuesday after being indicted by a grand jury in a cheating scandal that rocked the district and drew national attention. By 10:00 p.m., 27 of 35 educators had turned themselves in at the Fulton County Jail to face charges including racketeering, theft by taking and making false statements about their roles in an alleged plot to falsify students' standardized tests. Eight of them had been released on bond late Tuesday, the Fulton County Sheriff's office said. But the indictment paints another picture of Hall, one of a superintendent with "a single-minded purpose, and that is to cheat," Howard told reporters last week. According to the indictment, Hall placed unreasonable goals on educators and "protected and rewarded those who achieved targets by cheating." It also alleges she fired principals who failed to achieve goals and "ignored suspicious" test score gains throughout the school system. 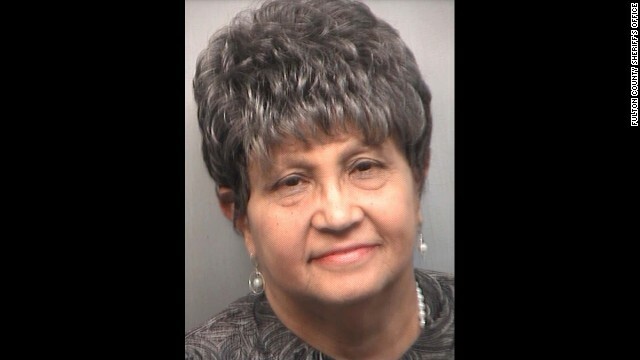 Her bond was reduced from $7.5 million to $200,000, the Fulton County Sheriff's office reported. On Tuesday, bond was set at $1 million for Donald Bullock, a testing coordinator at Usher/Collier Heights Elementary School, Theresia Copeland, a testing coordinator at Benteen Elementary School, and Gregory Reid, a Parks Middle School assistant principal. Bond amounts were set by grand jurors. Others who turned themselves in included testing coordinators, teachers and an instructional coach, said Fulton County Sheriff spokeswoman Tracy Flanagan. Investigations into the remarkable improvements on standardized tests were first reported by The Atlanta Journal-Constitution newspaper. A state review determined that some cheating had occurred in more than half the district's elementary and middle schools. About 180 teachers were implicated initially. Cheating is believed to date back to early 2001, when standardized testing scores began to turn around in the 50,000-student school district, according to the indictment. For at least four years, between 2005 and 2009, test answers were altered, fabricated and falsely certified, the indictment said. "We've had cheating all up and down the line. It was absolutely amazing," said Michael Bowers, a former Georgia attorney general who investigated the cheating scandal. Bowers said there were cheating parties, erasures in and out of classrooms, and teachers were told to make changes to tests. "Anything that you can imagine that could involve cheating, it was done." During the investigation, he heard that educators cheated out of pride, to earn bonuses, to enhance their careers or to keep their jobs, he said. Some teachers, overcome with emotion, fainted during his interview with them, he said. "Not only were the children deprived, a lot of teachers were forced into cheating, forced into criminal acts," Bowers said. "Now, granted, they did wrong, but a lot of them did this to protect jobs." Educators and community members reacted Tuesday to the charges. "The Atlanta school community is obviously very upset about this," said Stephen J. Alford, Atlanta Public Schools' executive director of communications. "I don't want to pass judgment on the people, but we've had a lot of parents who wanted to express their disappointment." In a statement, American Federation of Teachers President Randi Weingarten and Georgia Federation of Teachers President Verdaillia Turner wrote: "We do not condone cheating under any circumstances. Academic achievement can never be separated from academic integrity, which is why the Georgia Federation of Teachers was the first whistle-blower to expose Atlanta testing irregularities. "Tragically, the Atlanta cheating scandal harmed our children and it crystallizes the unintended consequences of our test-crazed policies." CNN's Jamie Gumbrecht, Catherine E. Shoichet, Joe Sutton, Josh Levs and Chelsea J. Carter contributed to this report.